Recently we posted a story about Matt Tribe, of Ogden, Utah, engaging in Random Acts of Pasta. Now we bring you a story about organized acts of pasta. 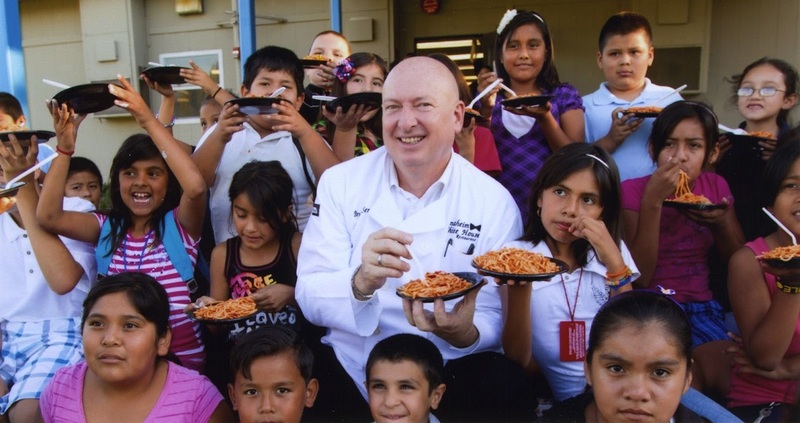 Ten years ago, Bruno Serato, the chef and owner of the Anaheim White House Restaurant, a fine Italian restaurant in Anaheim, California, visited the local Boys and Girls Club with his mother, Caterina. When he saw a young boy eating potato chips, the director of the club explained to him that this was the boy’s dinner. And so began an organized pasta charity that today feeds 1,200 motel kids every night. Serato named the charity after his mother: Caterina’s Club. Bruno Serato with children and pasta! More recently, Serato began a new initiative. Feeding motel kids was good. But even better would be to get their families into a real home. And so began a new initiative to pay first and last month rent for families who can afford the rent, but are stuck in hotels because they cannot pull together that much money all at once. This is a charity that helps families to help themselves. And it was founded by a man who arrived in America from Italy in 1980 with just $200 in his pocket. Every night when I feed the kids, I’m very happy. But at 5:30, when I know we’re taking the children back to the motel area, I’m sad, because I know where they go. . . . The great American family, the ones who work all their life, end up in the motel room because they lost home, they lost job. It’s not their fault. They want to get out for the safety of the children. But the problem, when you lose everything, your credit is bad, how can you save the first and last month deposit? I will help you to pay first and last month, because that is the only thing that you need. The beauty of Serato’s generosity is its specificity. He is making a life-changing impact on society one family at a time. This is something anyone can do. You don’t have to be a millionaire to change the world. Try $2,000 at a time—the cost of getting a family into a nice home—and see what happens. Or try 60¢ at a time: the cost of feeding one hungry child a nutritious dinner of pasta. To learn more, get involved, or donate, go to: Caterina’s Club, Serato’s non-profit charitable foundation.